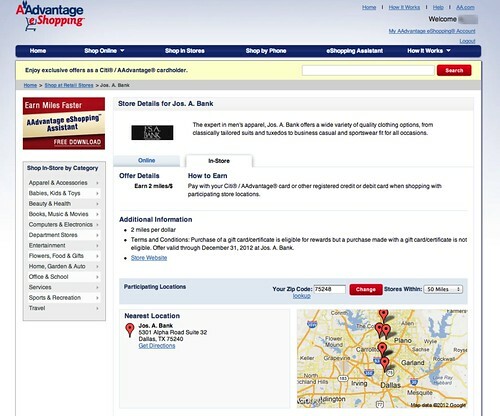 The AAdvantage eShopping Mall launched with a new redesign last week and it’s a big improvement over the previous version. Everything is a little easier to find and there a several new improvements that make it easier to shop, but my favorite new feature is that I don’t have to log in every time I visit the site. The old site used make you log back in after something like 10 minutes of inactivity, with the new site, once you authenticate it keeps you logged in until you sign out. Nice design. The website no longer looks like 1998. 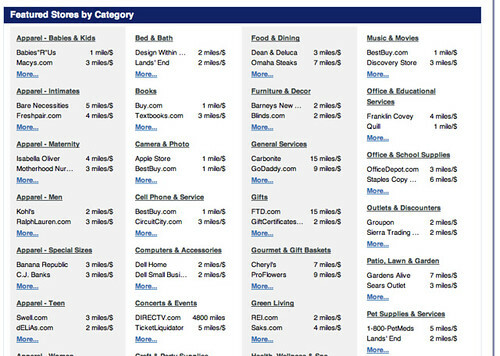 Easier to use shop by category function. 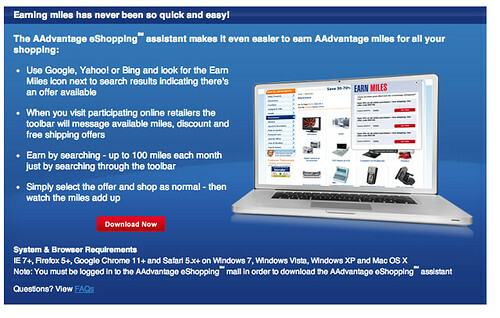 There’s also a new AAdvantage eShopping Assistant that’s will earn you some extra miles by searching and shopping. When you visit a participating AAdvantage eShopping retailer the toolbar will let you know if you can earn miles, discounts, or free shipping. You can also earn up to 100 AAdvantage Miles when you use the toolbar to search. Enter the AAdvantage eShopping Mall 1 Million Miles Sweepstakes! Join our celebration of the launch of our new and improved American Airlines AAdvantage eShopping mall with a chance to win American Airlines AAdvantage miles! 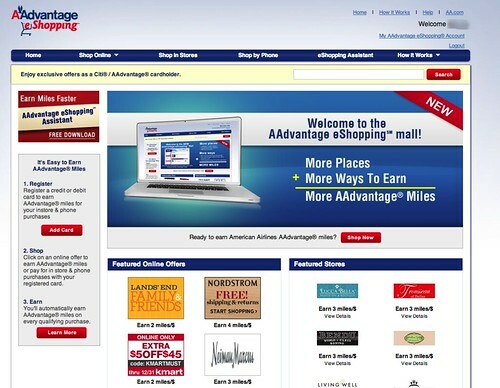 Visit the new and improved AAdvantage eShopping mall and enter for a chance to win. You could be 1 of 10 AAdvantage eShopping mall members to win 100,000 miles! Start shopping today and learn how to increase your chances of winning. 1. Sign up to receive the latest AAdvantage eShopping special deals and discounts via email. Go here for the rules and go here to enter. Good luck! Hope that it is better at tracking purchases… seems like every time I used it, I never got credit for it. @ Adam – It’s still managed by the same people, Cartera Commerce. Not sure if they’d updated their tracking system, but let’s hope so. Thanks for the comment! I just got screwed out of 5000 AAdvantage Miles. Never posted from one of their vendors, they denied me. I stated I had the email confirmation from the vendor stating exactly how many miles they said I earned for the purchase. They never once asked to see the email just kept blaming me that I must have done something wrong and that the vendor wouldn’t credit them, so I was SOL. 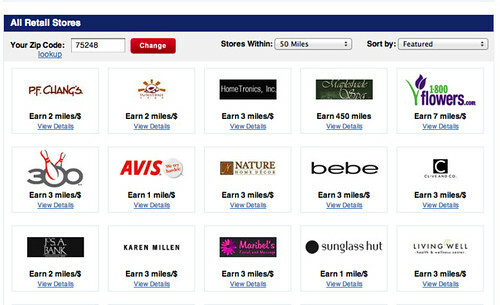 AVOID AA shopping portal or give your miles a 50/50 shot at posting. Other portals have been very good a posting missing points, AA was a HUGE fail on this task, even when I had proof. One big improvement for me is the addition of Lowes. It looks like they took the UA mileage mall and slapped AA on it, fine by me, the UA mall posted faster than the old AA one anyway. as long as its run by Catera you have a good chance of never seeing your points…they screw up all the time…it almost seems intentional. Then they have NO customer service, just bots and form letters, if you do have a problem it will take months and still only have 50/50 chance of getting it resolved…boycott any Catera run site…the airlines wont take responsibility for the site..they will just refer you and your problem to Catera. @ Guest @ wise2u – Thanks for you comments. Both of you posted using anonymous email accounts. Please post a follow up comment with an email address I use to contact you with, I’d like to hear your about your experience. when i will i find out if i won the Sweepstakes for 500,000 Skymiles ??? @ zack – They will notify you. You can find a list of winners at http://www.aa.com/winners.